Please click on the name of each functional ferrite powder below to see more information on their unique qualities, as well as examples of how or where they can be used. Examples of Application: Powder transport, filler, etc. 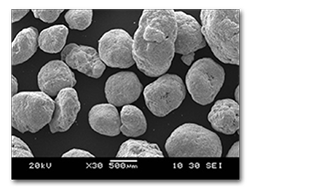 Soft ferrite powder with an average particle size of 200µm~5mm. These large size particles are easy to handle, and can be used for various purposes including magnetic filler and electrophotographic carrier powder. Examples of Application: Water treatment, soil remediation, absorbents, filters, etc. 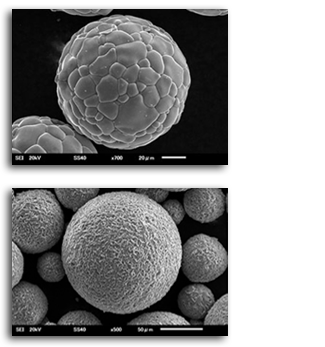 Spherical soft ferrite powder with an average particle size of 5~30µm. The surface of these ferrite particles are designed and customized from smooth to wrinkled. The large surface area and the customizable surface design gives multi yet highly functional performance. Can be used for water treatment, soil remediation, absorbents, filters and other applications. Examples of Application: Blood test kits, analysis for biological studies, etc. Ferrite powder produced with compositions that meet with FDA (U.S. Food and Drug Administration) approval. Both soft and hard types are available. The ferrite powder can be resin-coated with FDA approved ingredients upon requests. Suitable for medical and cosmetic applications. Examples of Application: Magnetic fillers, magnetic fluid, magnetic ink, etc. 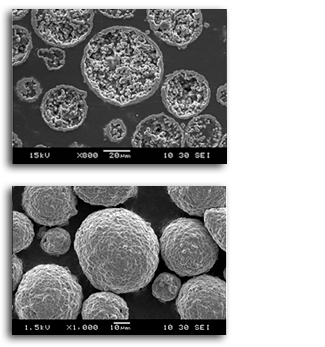 We developed this spherical ultrafine nanoscale soft ferrite powder produced by a special sintering method. 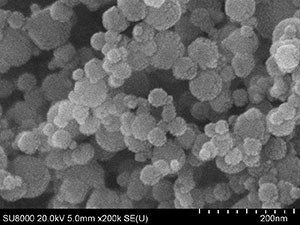 As these ferrite particles are metal oxides, this ultrafine ferrite powder is oxidation-resistant and lasts longer compared to nanoparticles of regular metal powder, and provides chemical stability. These ultra fine ferrite particles have high dispersion capability with various solvents, and can be used for magnetic ink, magnetic fluid etc. Various kinds of solutions with dispersed ultra fine ferrite powders are also available. Examples of Application: Electromagnetic wave shielding, pigments etc. Our flake shaped ferrite powder has good orientation, and is used as filler for electromagnetic wave shielding. The ferrite composition design and the particle characteristics such as thickness and particle sizes can be customized upon requests. This flake shaped powder can be used as pigments as it has a metallic luster that only comes from its flat and highly smooth surface while being a metallic oxide. Examples of Application: Catalyst support, Low density filler, absorbents, filters etc. When producing spherical ferrite powder, it’s almost impossible to control both outside and inside structures separately. 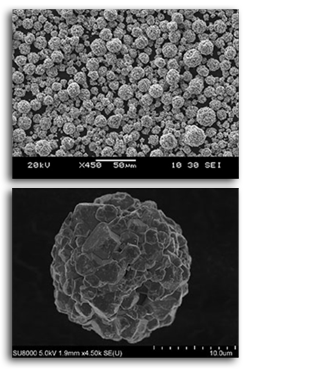 However, we successfully developed spherical ferrite particles with porous parts inside and shell-structured structure on the outside. 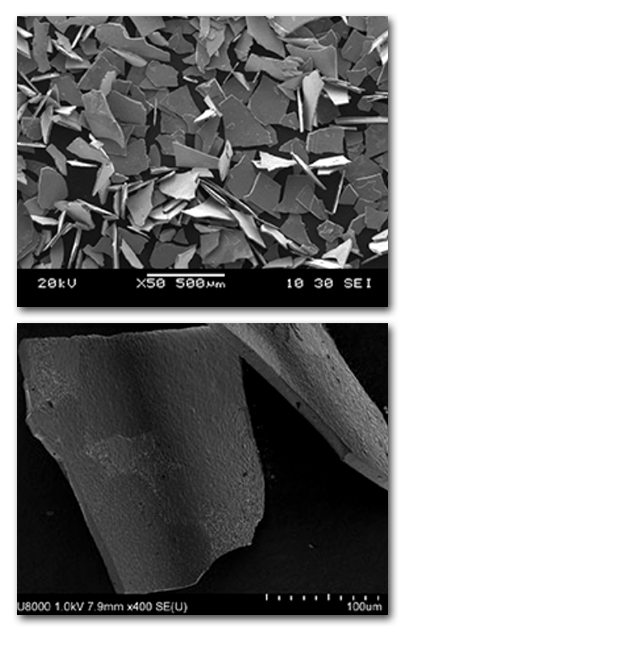 These new ferrite particles also enable to obtain high pore volume and low apparent density, and can be used as a low weight functional magnetic filler. Plus, with the high porous volume structure inside, this ferrite powder can turn into catalyst support or absorbents. Established in 1959 in the United States, Powdertech expanded into international operations in 1989. Today this innovative leader in powder technology is a world leader in manufactured ferrite powders. © 2018 Powdertech. All rights reserved.